The problem with statistics is that they are based on statistics. And sisnce most statistics is based on sample goups, and since no sample group can be a true representation of the real population, then the whole lot is hypothesis. And many researchers are not especially proficient with statistics, as sadly are some people using statistics for analysis. The next bit of research will of course prove completely the opposite. I also need to learn to type! Spot on, Andrew. It has been pointed out to me that in a previous post under the "scares" label I referred to a study indicating that drinking coffee was a factor in pancreatic cancer. So it's not just bacon sarnies that'll kill you, but your cuppa too! I do hope the earnest researchers of this latest study were aware of this as they sipped their skinny lattes. Please excuse the deleted comment - that was me. the words were a bit jumbled. Statistically normal. If that's a new Market Harborough Pie you can expect a visit. I suspect, sadly. that it's the beast that I have already sampled. How's the sloe gin doing? And how about an update of Miss Whiplash's scars? I'll expect a report detailing the percentage drop in scar tissue, compared, of course to a control area of un-scarred skin. Pictures and diagrams are required. Just be patient for a year or two. 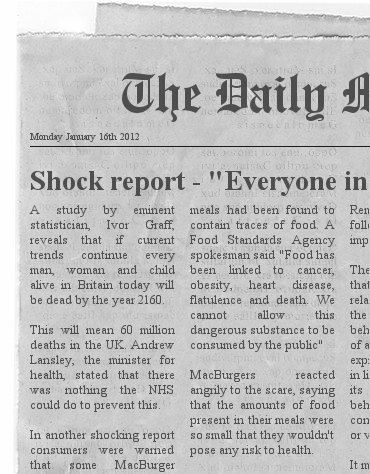 By then there will be a new report warning of the dangers of insufficient bacon and sausage in the diet and recommending at least one all day breakfast per week. And potatoes will have been through the good for you/bad for you cycle at least one more time. There is nothing in life that can't have the fun taken out of it if someone is really determined. the putative merits of reducing the intake of salt is challenged by the findings of a major study in the US that suggests those with a low amount in their urine have a higher (rather than lower) mortality rate from circulatory disorders. Meanwhile, it is interesting to note that those responsible for propagating such dietary advice do not, according to a paper in the British Medical Journal, comply with it themselves: an analysis of the salt content of their meals reveals they consume twice the quantities currently recommended to the public. ... I'd still go easy on the crisps though. Alan, the sloe gin was abandoned this year, but last year's is still going down a treat. One bottle reserved for TGOC 2013. Miss W is appalled at your lust for scarred female flesh, and suggests a course of corrective therapy. Read this myself too - I liked the article I read a way back that says milk drinking give you parkinson's. I ask you. Next it will be using a smartphone on a sunday will kill you. Pie looks nice by the way. ... I think the phone/brain cancer thing will be back with us before long, Carl (sigh). Just a tip next time you're in the Dales - the best pies in the world and the universe and everything are assembled in the celebrated pork pie establishment on grassington road in Skipton. My slow gin is fab by the way... it won't make it to May. We hope to be up there in March - pie shop noted, Mike. Yum!